iVoice is an extraordinay healthcare product that can effectively improve the blood and lymphatic microcirculation of vocal production, extend the vocal range, amplify the volume and enhance the stamina. A good vocal projection with enhanced intelligibility can be created easily without putting a strain on the vocal muscles, which can prevent vocal fatigue or damage from overuse. iVoice helps enhance your vocal production, extend entire vocal range and widen volume dynamics. So, you can easily express your emotion with improved articulation, timbre and intonation when you sing or give a speech. iVoice works like wonder the moment when you put it on. The iVoice will increase the breathing efficiency and boost the volume effortlessly without putting a strain on your vocal muscles. Your audience will be delighted and impressed too by the improved vocal projection with enhanced intelligibility. 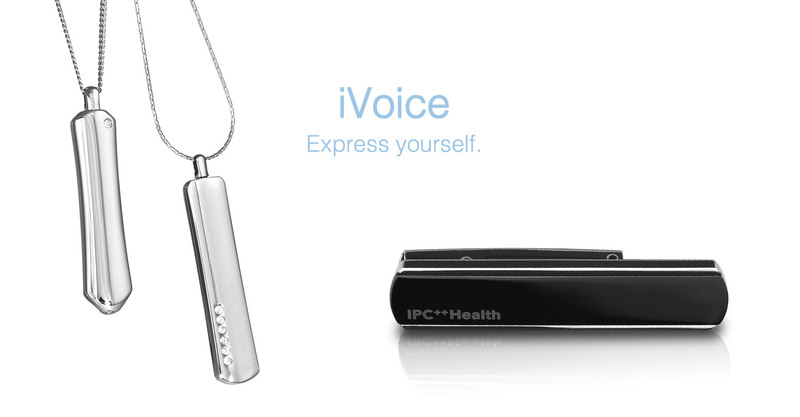 The iVoice is portable and wearable while two pendant designs (Classic and Slim) and a clip are available to suite your need. Both pendants feature unique contemporary jewelry design. iVoice Classic has a more pronounced effect on the lower register and brings out a richer tonality. iVoice Slim has a more pronounced effect on the higher register and gives an immaculate quality to the voice. iVoice Clip has an all-round effect on all vocal registers and brings out a fuller vocal tone. iVoice promotes the blood and lymphatic microcirculation of your voice production system. You can talk longer or speak louder without putting much stress on your voice muscles, which can reduce vocal fatigueor damage from overuse. Various metabolic and biological functions are improved as a result of the PVA Field, carried out by the iVoice. You will experience the incredible improvement of what iVoice brings along noticeably, including better breathing efficiency, faster reaction, greater body balance and stamina. Consequently, you can handle the sport performance and other energy-intensive activities far more easily. You will be surprised of what 3 iVoices can do. Put 2 additional iVoices symmetrically on both sides of the hip, ideally in the left and right pocket forming a triangle with the iVoice on the chest. The effect is much more prominent and powerful beyond your imagination. Completely safe and reliable to use without any adverse effect ever reported by any users so far. iVoice does not contain any materials that are magnetic, electromagnetic, radioactive, toxic or corrosive. iVoice is suitable for everyone. You will love the iVoice immediately for activities associated with vocally demanding jobs, including singing (lead singers, backing vocalists, choir, musical actors, entertainers, etc.) and speech (public speakers, politicians, pastors, teachers, presenters of seminars, salesman, actors, etc. ); and physically strenuous activities in most sports and demanding activities. 1.9" x 0.5" x 0.3"
Product Safety Does not contain any materials that are magnetic, electromagnetic, radioactive, toxic or corrosive. iVoice is enabled by Pico Technology.